For some reason this month turned out the highest traffic in the history of this blog. It is particular interesting considering that I have not been doing a good job keeping it updated. So I feel obligated to add at least one post before December. Let me cover some progress I made with my offshore provider I inherited through the M&A process. In particular let me cover some metrics we have established in order to control the relationship. This set of metrics is a preliminary set based primarily on what my vendor could easily retrieve from the tracking systems they already have in place. A couple months ago we agreed on several metrics and established high level benchmarks. I believe that you can not enforce benchmarks on day one. You should setup goals and see whether they are reasonable to achieve considering multiple factors ranging from abilities of vendor and your own organization to quality of the tools that are used to collect the info. I do not know how many times one of my managers or I said something like “Darn employees… Can’t live with them, can’t live without them either…” Almost all issues one faces in management career come from employees, well, very much all the issues are solved by employees as well. Every time when you deal with yet another personnel issue you throw your hands in air asking why it can’t be simple at least once in a while. Well whether you want it or not Murphy rules and if everything appears going well that only means that you are missing something. For some reason (premonition?) I was thinking about this the Saturday before Thanksgiving week. The thought was so strong and persistent that I decided to sit down with my notebook and take a quick walk through the list of ongoing projects and open issues. The timing, from some twisted standpoint, was perfect – approaching long weekend, many people on vacation traveling, end of month, oncoming deadline for a number of high visibility projects. Nope, neither the list of projects nor the list of open issues, nor any other list I looked over gave me any reason for extra concern. Relived to the point of complacency I went on with my usual weekend chores. The first volume of Pragmatic Outsourcer – the book primarily based on the materials of this blog is almost ready. There still a few things to clean up, pictures to pick, codes to request but I can see the light in the end of tunnel. The volume is going to be published as e-book and available as free download from this site. I believe book format works better for delivery and consumption of material that is covered in this blog, yet it has its issues as well. In some way e-book is a static snapshot of one’s thought process while blog is a near real time stream. So both forms are important and would bring a better set of tools to the reader. That’s why I decided to take the effort to create the book. Creating the book turned out to be harder than I thought even though a large portion of content was readily available. When you deliver material one random chapter you do not need to worry about blind spots (important material not covered), structure, consistency, etc. All that becomes a serious concern and takes substantial time to address. With my ESL handicap I also have to deal with challenges of style, grammar, etc. that for some reason I decided to take much more serious than in this blog. I guess having ISBN number assigned to the written word raises the bar, at least in my mind. In that arena I had to seek professional help which naturally came from offshore. Eat your own dog food so to say. Anyway, I am pretty excited and hope to put the first volume in front of you shortly and then immediately proceed to the second one – vendor selection. 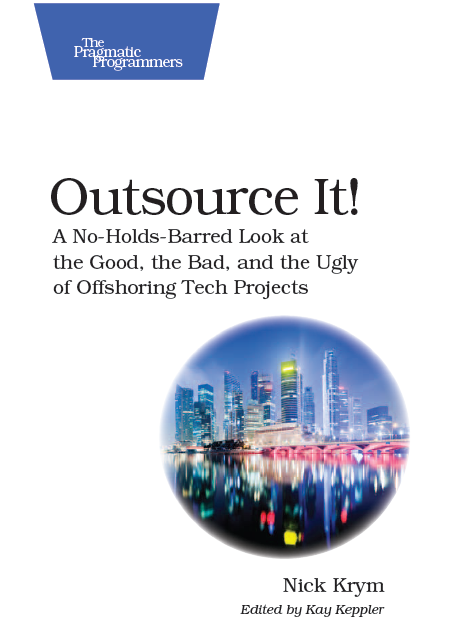 Hopefully in not so distant future the full scope of offshore outsourcing from decision to termination will be covered in the series of e-books I have in mind. And then… if the traffic to e-book justifies it I would love to put all my Tips, Tricks and Traps of IT Outsourcing in a hard or even better paper cover… for dummies or unleashed series… ha.. judging by what it takes to create e-book publishing in-print must be a very tough journey, so the traffic must be really good to justify it.